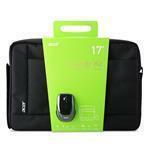 Keep your equipment safe and secure with the Stater kit bag from Acer. It's great fo keeping your notebooks with a display size of 43.9 cm (17.3") free from scratches. Practical and compact safely pack your essential devices in this bag from Acer, so that, even on the go, you always have them within reach. It's made of a durable, synthetic material, which can be easily cleaned with a damp cloth.